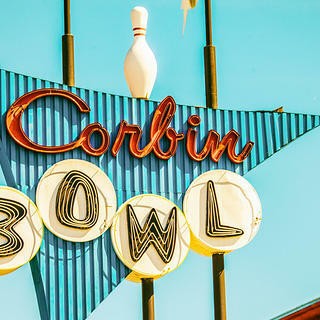 Here, we showcase 11 longstanding signs around the city, starting with the Googie-style sign above Corbin Bowl in Tarzana, erected in 1958 (above). Some of these signs are notable for their artistry, others for their longevity. But all have had a place in the city's landscape for generations. 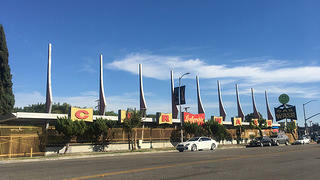 The 1960s sign for Lankershim Car Wash in North Hollywood spans the entire structure and fully embraces the Googie style. 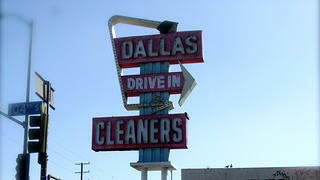 This sign outside Dallas Drive-In Cleaners in South Los Angeles dates to the 1950s. 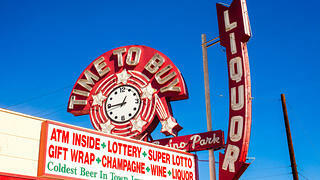 It’s hard to miss this 1950s rooftop sign above Time To Buy Liquor in Encino, especially when it’s lit up at night. The double-sided sign is mounted to its building with a metal armature and features a clock circled with neon stars and lettering, plus a large arrow. 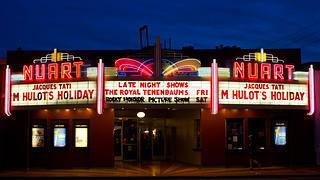 The marquee outside the Nuart Theater, an arthouse theater in West Los Angeles, was identified by SurveyLA as being an excellent example of a marquee sign with the iconic design and typography associated with a pre-World War II neighborhood theater in the city. 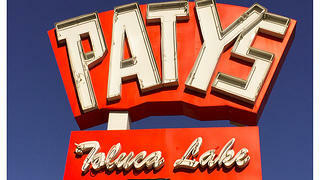 The building that houses Paty’s Restaurant in Toluca Lake has been altered extensively throughout time, but the neon sign has been affixed to the rooftop since the restaurant opened in 1960. 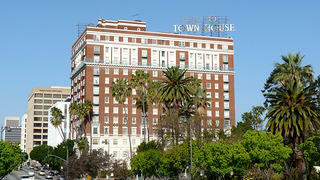 When it opened in 1929, the Town House was a stately Beaux Arts apartment tower. In the 1930s, it was converted into a hotel, and after it was purchased by Sheraton Hotels in 1954, it became known as the Sheraton-Town House. Today the building holds housing. Though some of its letters are missing, its rooftop sign still stands. The sign that’s been standing outside Windy’s New and Used Cars in South Los Angeles since 1959 features elements of the Googie design style. 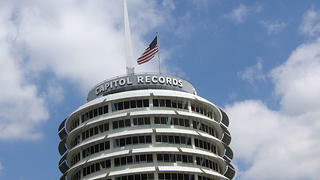 One of the most iconic and instantly recognizable buildings in Hollywood, the Capitol Records building and sign was designed by Welton Becket and Associates and completed in 1956. The blinking light of the rooftop sign repeatedly blinks “Hollywood” in Morse code. 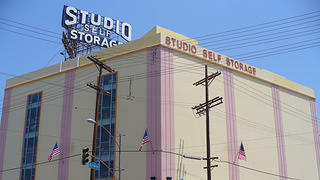 The large rooftop sign for Studio Self Storage in North Hollywood is mounted on a metal scaffold and dates back to the late-1940s. 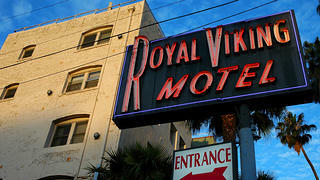 The bright neon lettering on the freestanding sign outside Royal Viking Motel at the intersection of Alvarado and Third streets has been shining since the 1950s.